The Chinese yuan is rallying against its American counterpart at the end of the trading week, despite the national economy growing at its slowest pace in about a decade. As the US-China trade war intensifies, there are fears that the economy could cool down even more. According to the National Bureau of Statistics, the third-quarter gross domestic product (GDP) climbed 6.5%, down from 6.7% in the previous quarter. The market had forecast a jump of 6.6%. This is the slowest it has been since early 2009, the height of the international financial crisis. In the aftermath of the report, domestic stocks cratered as much as 3%. But officials from the People’s Bank of China (PBOC), the Banking and Insurance Regulatory Commission, and the Securities Regulatory Commission attempted to ease the market with promises of state support to spur economic growth. In recent months, Beijing has put more money into the economy, announced more than 1,200 infrastructure projects, and left interest rates accommodative. We have no reason not to be confident in the bright prospects for China’s economic development. Chinese exports soared in September as traders attempted to take advantage of lower prices prior to higher tariffs. At the same time, it does suggest that they are concerned about the escalating trade spat between the world’s two largest economies, especially if other sectors are taking a nosedive. The government reported that annual industrial production growth was 5.8%, down from 6.1%; consumers say they are spending less, though retail sales grew 9.2%; business confidence is falling; automobile sales declined; and fixed asset investment dropped. In the labor market, the unemployment rate dipped from 5.0% to 4.9% last month. In attempt to minimize the damaging effects of the US-China trade dispute, leaders have taken the initiative to improve relations with other trading partners, particularly Japan, which is started to be targeted by Washington in the quest to balance trade. 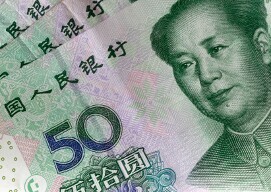 The USD/CNY currency pair tumbled 0.12% to 6.9295, from an opening of 6.9378, at 15:40 GMT on Friday. The EUR/CNY advanced 0.24% to 7.9665, from an opening of 7.9476.